Blooom co-founders Kevin Conard, Chris Costello and Randy AufDerHeide, along with President Greg Smith pose with the grand prize check at the 'One in a Million' startup competition. 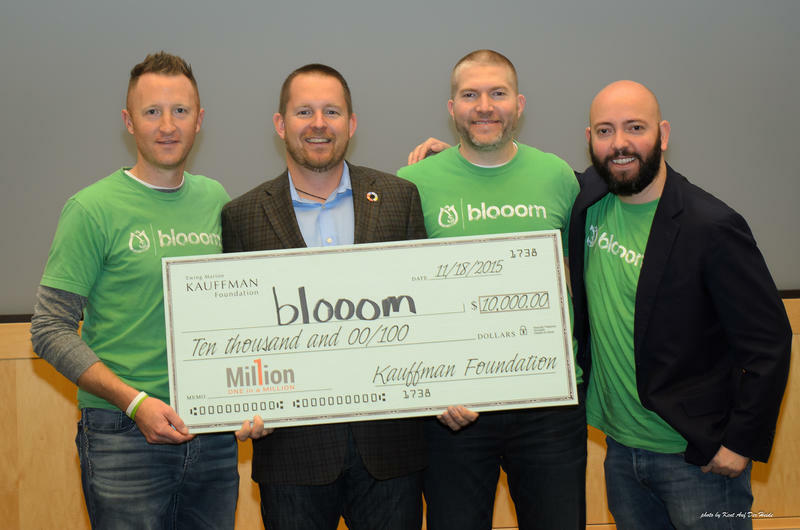 It’s been a big year for Blooom, the Leawood, Kansas, based finance-tech company. In addition to taking home a $50,000 grant from LaunchKC during Techweek in September, the company has just been crowned the first-ever winner of the "One in a Million" startup competition, presented by the Kauffman Foundation's 1 Million Cups program. The grand prize — $10,000. “This means so much me and to the entire Blooom team ... I do have a little chip on my shoulder and something to prove that there is talent and innovation that comes from the Midwest,” Blooom co-founder Chris Costello told Steve Kraske on Up To Date. His company has risen quickly in the two years Costello since started it with co-founders Randy AufDerHeide and Kevin Conard. Like many tech-startup stories begin, Blooom’s journey starts in a basement. Hey, at least it’s not a garage. “The early meetings were in [co-founder] Randy’s basement,” said Costello. That was back in 2013. Costello previously worked managing money for the very wealthy, but something had always bothered him about his job. “Younger people or people without a gazillion dollars largely were left out of access to quality financial advice,” he said. He says there are 90 million people in the United States with a 401(k) or 403(b) who would never get in the door to a qualified financial advisor. Blooom is targeted at those people. It manages a person’s 401K portfolio online through a series of algorithms using simple language with little cost to the client. Costello and his co-founders quickly grew from a staff of three to business of almost 20 employees and a new office — at the Park Place center in Leawood. The company’s growth hasn't slowed. Zach Anderson-Pettit, Blooom’s "jack-of-all-trades," said they started their marketing campaign less than a year ago. This week, Blooom announced it had clients at all fifty states. Despite coming out on top in two major startups competitions, Blooom’s co-founders hesitate to claim that they’ve made it. For now, their biggest challenge is getting people to actually care about their 401(k)s.
“People are generally apathetic when it comes to their retirement,” Costello said. “Maybe Blooom might say, give us three minutes and then go back to forgetting about your 401K. We’ll take it from there,” Costello said. Lisa Rodriguez is associate producer of KCUR's Up To Date. You can find her on Twitter, @larodrig. 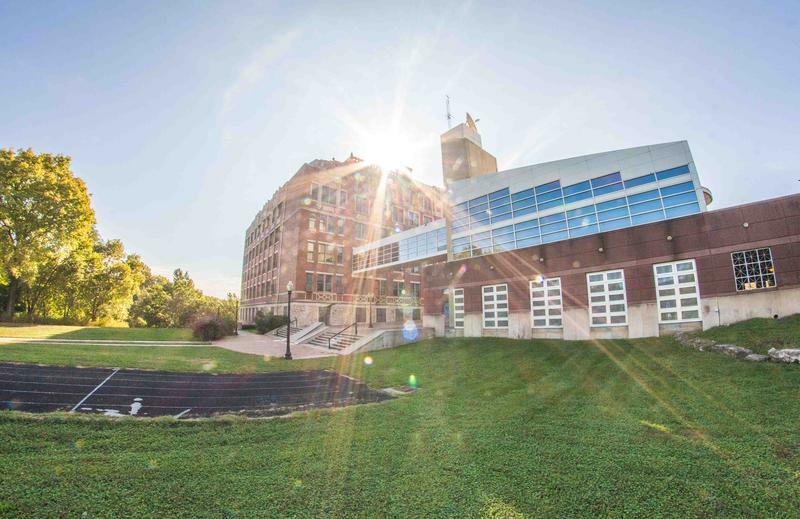 In recent years, Kansas City has emerged as a startup hub. Now, the metro's burgeoning tech community will soon have a centerpiece space in which to do its work. The word "failure" generally has negative connotations but in the startup world, failure is considered a good thing. We talk about how it got its positive spin and how Kansas City could do a better job embracing it. Gov. Jay Nixon announced more than $1 million in Missouri Technology Corporation grants for three metro-area businesses Thursday at Kansas City’s first Techweek conference. The national technology conference will stop in Kansas City for the next five years, drawn here in part because of Google Fiber and the Cisco Smart City initiative. “This is the kind of thing to help brand the Kansas City region as a tech startup hub,” Nixon said. We live in a time where pretty much anything you need can come right to your door, thanks to technology — that is, if you live in a big city like New York or San Francisco. But a trend that has exploded in big cities has been slower to arrive in the Kansas City metro. Blake Miller, Partner & Director of the Accelerator at Think Big Partners in Kansas City attributes part of that to the physical layout of the city. “A lot of it is our sprawl, we’re 319 square miles of a city. For a lot of these companies to become truly successful it’s [about] density and the clusters of people around it,” Miller told Up To Date host Steve Kraske. That sprawl, Miller says, has led to a driving culture in the metro.